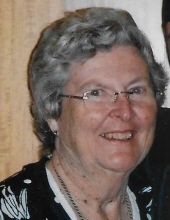 Janice Lee Losson, 84, of Palmyra, Missouri passed away Wednesday, November 28, 2018 at Maple Lawn Nursing Home in Palmyra. Funeral Services will be at 11:00 AM Saturday, December 1, 2018 at the Lewis Brothers Funeral Chapel in Palmyra. Pastor Eric Anderson will officiate. Burial will be at Greenwood Cemetery in Palmyra. Friends and family are invitied to Janice's Life Celebration at a Visitation will be from 5:00 PM to 7:00 PM Friday, November 30, 2018 at the Lewis Brothers Funeral Chapel. Janice was born October 13, 1934, in Hannibal, MO to Albert B. and Virginia Lee Harris Dye. She was married to James M. Losson on March 14, 1954 in New London, MO. He preceded her in death November 11, 1997. Survivors include 3 Daughters, Lesa Stark (John), New London, MO, Jeni Hudson (Mike), Palmyra, MO, Meri Yager (Rick), Palmyra, MO, 1 Son, James "Newt" Losson, Palmyra, MO, 14 grandchildren, 6 great grandchildren, and 1 Sister-in-law, Betty Bross (John), Palmyra, MO. She was preceded in death by her parents, 1 brother, Jack Dye,1 daughter-in-law, Brenda Losson, twin grandsons, Zeke & Zach Losson. Janice was a homemaker, but was also a secretary for several years at Palmyra Schools and later at Farmer's Mutual, also in Palmyra. Away from work, Janice simply enjoyed relaxing on her porch swing at her home. A talented cook, she made the best fried chicken and also lemon meringue pies. Knitting, painting china and reading her daily newspaper were also pleasures that Janice enjoyed. She was an excellent seamstress. Janice liked to follow Mizzou sports, Kansas City Chiefs football and St. Louis Cardinals baseball. Most of all, Janice cherished the time she shared with her family. Janice was a member of Palmyra United Methodist Church where she was a longtime Sunday school teacher. Memorial contributions may be made to Cherub Department @ Palmyra United Methodist Church or Donor's Choice . Pallbearers will be Kent Bross, Kirk Bross, Kerry Bross, Austin McDonald, Ryan Cook, and Levi Lyon. Honorary pallbearers will be Janice's grandchildren, Brock Reed, and Holden Hudson. To send flowers or a remembrance gift to the family of Janice Lee Losson, please visit our Tribute Store. "Email Address" would like to share the life celebration of Janice Lee Losson. Click on the "link" to go to share a favorite memory or leave a condolence message for the family.